The Mt. Airy Md real estate market has been a sought after location in Central Maryland for decades, as homes have been built from farmland, and the population has increased. Mt. Airy homeowners have discovered the location is ideal; close to major cities and far enough to enjoy the perks of rural living. The Mt. Airy area, zip code 21771, is often referred to as “the four corners”, as the town is located in the four counties of Frederick, Montgomery, Howard and Carroll. The Mt. Airy area has a population of just under 10,000 people. The town saw a growth of 45% since 2000. Of the roughly 3200 households, half are families with children. The median age of residents is 36 years old. Mt. Airy is about 30 miles from the Baltimore, and about 45 miles from Washington D.C. and 15 miles from Frederick. The majority of residents commute to work given the town’s central location. The historic downtown area and the various shopping centers surrounding downtown provide a miriad of choices for restaurants, grocery shopping and household goods stores. There are many small business people who thrive in Mt. Airy. Compared to the rest of the country, Mount Airy’s cost of living is 39% higher than the U.S. average. Mount Airy Main Street Association (MAMSA) is a group of dedicated volunteer residents and business owners interested in revitalizing Mt. Airy’s historic downtown business district. MAMSA and the Town of Mt. 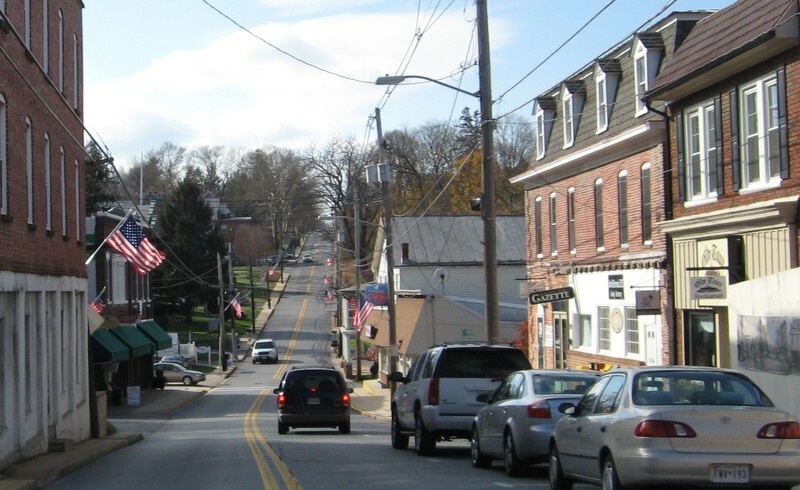 Airy were awarded a Main Street Maryland Community designation in April, 2004. Follow their Facebook page for all the latest info. The town of Mt. Airy is best known for it’s friendly small-town charm. The community events year-round are a draw for people from all over the central Maryland region. From the town carnival in July, Independence Day Fireworks, to the Spring Festival, to warm weather farmer’s markets and family friendly movie nights, residents truly enjoy Mt. Airy living. Summer concerts at Wildwood park are a family favorite. The town of Mt. Airy is governed by a Mayor and Town Council. You can learn all about Mt. Airy living on the town website, Mount Airy Md.org. The Carroll County Library in Mt. Airy has many events for residents of all ages. There is a vibrant active adult community in Mt. Airy. A favorite spot for Mt. Airy residents in the warm months is Jimmy Cone ice cream parlor. Nearby Linganore Wine Cellars is the location for music and various festivals. Consult the Frederick County Schools and Carroll County Schools websites for an updated map. Carroll Community Colldge, Frederick Community College, Montgomery College…all within 20 miles. McDaniel College, 17 miles, Mt. St. Mary’s University, 25 miles. On average, commuters spend almost 40 minutes on their commute. Commuter routes from Mt. Airy include I-70 to Baltimore and Frederick, and Howard County, US-27 to Westminster and Montgomery County locations and Route 75 to Montgomery County and I-270. Frederick has two train stations, and a Greyhound station. Baltimore-Washington Airport is 40 miles east, Dulles Airport is 60 miles. The Town maintains recreational areas which allow fishing, hiking, tennis, ball, street hockey, skate boarding and picnicking. Local parks include Watkins State Park with the Dog Park and Skate Park, Prospect Avenue Park, and Izaak Walton League Reservation. Gillis Falls Park is nearby in Carroll County. Poplar Springs Park is east of Mt. Airy between route 144 and I-70. Patuxent River State Park is south of Mt. Airy and Damascus. Kemptown Community Park is southwest of the town on Route 80. Old National Pike District Park is between Mt. Airy and New Market on route 144. Rattlewood Golf Course is located off of Penn Shop Road in southern Mt. Airy, within the Rattlewood Neighborhood. West on I-70 is the Hooly Hills Country Club and Golf Course. Established in 1830 by Henry Bussard, Mt. Airy was first a train station for the B & O Railroad at Parr’s Ridge, a stop between Baltimore and Frederick Md. Milling, canning and sewing industries made up the early years of the economy; the proximity to the National Road (Rt. 144) contributed to the growth over the years. In 1984 The Mt. Airy Historic District was added to the National Register of Historic Places. Sell my Mt. Airy Home: What is my Home Worth? After 10 years in sales, I entered a real estate career and discovered a love of helping people find home! Consistently in the top 10% of Frederick County Realtors, I find great satisfaction in helping people navigate the waters of a home purchase or sale. I have been listing and selling homes throughout central Maryland for the last 24+ years. Call or send me an email so we can discuss how I can best serve your Mt. Airy Md Real Estate needs! A Realtors Guide to Mt. Airy Maryland Real Estate, Mt. Airy homeowners have discovered the location is ideal; close to major cities and far enough to enjoy the perks of rural living.